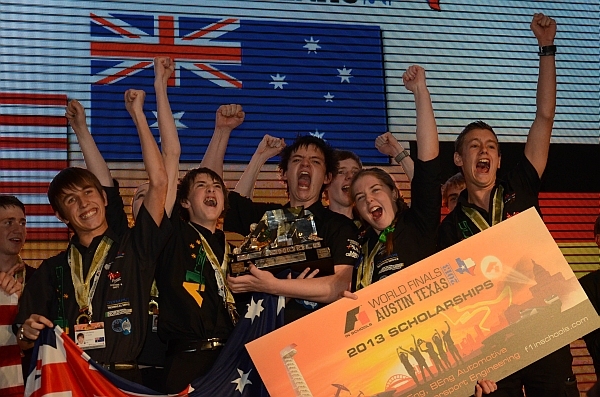 LEAP is very proud to congratulate the students from A1 Racing for winning the F1 in Schools 2013 World Finals in Austin, Texas. A1 Racing are a collaboration team between Pine Rivers in Brisbane, QLD, and Phoenix P-12 in Ballarat, Vic, who have continued the proud tradition of Australian students excelling at this international event by becoming the third successive Australian-based team to win the World Finals (with previous winners hailing from Tasmania and South Australia). In our last post, we mentioned that the use of CFD for aerodynamic design and stability at A1 Racing had already brought some early success, with their team having won the fastest car competition by leading the timetrial event. Later that evening, it was announced that A1 Racing was also the overall winner of F1 in Schools 2013 World Finals. Let’s go into some more detail on how LEAP’s CFD simulations may have assisted A1 Racing to design the fastest car at the F1 in Schools competition. To begin with, a detailed steady-state analysis was performed in order to evaluate the cars aerodynamic performance in terms of lift, downforce and pitching moment. By nondimensionalising the lift, downforce and pitching moment, the aerodynamic performance at any speed could be calculated and used to rank the different conceptual designs. It was shown that the most critical factors in obtaining accurate results in these initial studies was in creating a high-fidelity boundary layer mesh for the entire car, and also applying the advanced turbulence modelling capabilities of ANSYS to accurately predict regions of flow separation and the formation of vortices in the wake. - inclusion of exhaust gases from the CO2 canister that provides thrust to the car (It was found that in preliminary tests that this stream of high-velocity gas had a large influence on the wake profile, and therefore needed to be included to accurately predict the drag force acting on each car design). In addition to these “straight-line” CFD simulations, the cars were also simulated in a number of different orientations to evaluate the static stability of the car. The car was simulated for both zero angle, small angle and large angle perturbations of pitch and sideslip.. These combinations of different pitch and sideslip perturbations gave the designers a total of nine unique design points which were automatically run in a parametric study of the car’s stability using ANSYS DesignXplorer. Using this approach, the full matrix of simulation results were completed with design point each providing values for pitch, yaw, roll, lift, downforce and sideforce. This gave the car designers a full ‘aerodynamic map’ of the forces and moments in all orientations, from which the stability of the cars could be inferred. By better understanding aerodynamic stability causes and effects, the student car designers could aim to modify their designs to maximise static stability performance to ensure that their car is more aerodynamically stable and spends more of the race pointing directly towards the finish line (rather than fighting against the tether and wasting valuable energy on friction with the tether and track). Media and images courtesy LEAP Australia, A1 Racing, F1 in Schools and Re-Engineering Australia Foundation.